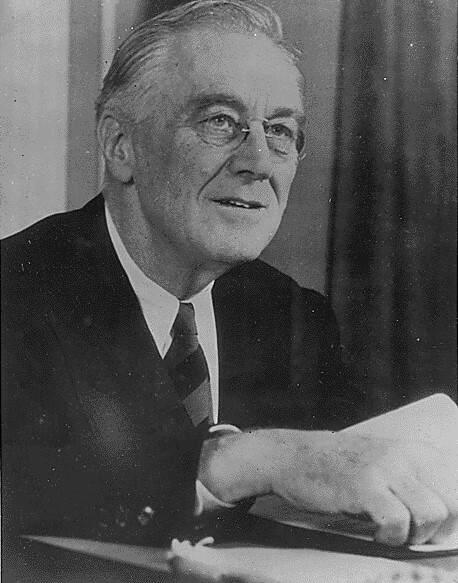 Franklin Delano Roosevelt, 32nd President of the United States, could have counted among his many achievements the creation of the New Deal, which reinvigorated the economy after the Great Depression, a victory over the Axis powers in World War Two, and, perhaps surprisingly, curating one of the finest collections of Oriental rugs in the country. According to his personal library, the former President spent his entire life in collecting. As a boy, he gathered a large collection of stamps, ship models, rare books, printings, coins, and drawings that expanded to include Chinese carvings, Scandinavian glassware, and Oriental rugs during his presidency. His interests became so expansive that in 1941 he placed all of his personal collections in the Franklin D. Roosevelt Library, now the core of a museum that numbers over 34,000 items. However, of all the vast collections of his historic and rare pieces, the Oriental rugs take prominence. The main room of the library is adorned with one of FDR’s finest pieces: a massive Persian rug designed by the acclaimed Iranian artist Imami, gifted to the President in 1943 during a wartime conference by Mohammad Rezâ Šâh Pahlavi, the Shah of Iran. With 50 knots per square inch, the rug took over 10 years to make, and is valued at more than $275,000. FDR’s Oriental rug collection was so vast that much of it today is unaccounted for. Pieces thought to be lost for decades inevitably turn up in someone’s private collection, or discovered by an appraiser in an unlikely place. In 2005, that’s what happened to John Ahdoot. The owner of Ahdoot Oriental Rugs in Midtown, Manhattan, John Adhoot has spent his entire life appraising, repairing, and selling Oriental rugs. While growing up in Tehran, Iran, John Ahdoot familiarized himself with the craft at a young age, as it was something of a family business. His work in Oriental rugs began nostalgically as he collected pieces that reminded him of home. He was fascinated that they had made their way through dozens of hands and several decades, and procuring them was something of an archaeological dig. Slowly, an obsession took hold. Over the years, John has been asked to look at nearly everything related to the rug market and offer his professional advice on the value, reparability, and the historical significance of a diverse range of pieces. These items range from small oddities to common rugs to pieces of unique historic import. Of all his appraisals, one rug stands out to him in particular. Like most of these stories, it began with a phone call. A friend knew a couple in New Jersey needing his appraisal services on a rug they had acquired and were hoping to sell out of financial necessity. John quickly made an appointment to view the rug in the couple’s home. Arriving at their New Jersey apartment, John appraised the rug as a Persian design of unremarkable quality and signature. It featured an Islamic pattern with a large, distinct mosque. The couple had been offered $500 for the rug by a local collector, but weren’t sure if they should part with it. Any other time, this would have been the end of his services. However, after leaving the couple’s apartment, John happened upon a newspaper kiosk, and on the cover of a magazine was a photograph of the very same rug he had just appraised. While it may be common to see similar patterns among mass-produced rugs, he knew this particular piece was one of a kind. The paper featured a story on President Franklin D. Roosevelt, and the rug had been owned by the President himself. John immediately made a phone call to the couple to set a new appointment for an appraisal. He returned to the couple with a new estimate—to the tune of $20-30,000. After weeks of research and phone calls, a historian explained that it had once been prominently displayed in FDR’s White House. After FDR’s death, the rug was placed in the entrance hall of the Springwood at Hyde Park, and then moved into the master bedroom after Sara Roosevelt’s passing. When the National Park Service acquired the home, the rug was sold to an anonymous bidder, and through the next few decades the original owner was forgotten. With the new appraisal, the owners had to decide if they’d sell it to one of the prestigious auction houses for a sizeable amount, or pass it along to family members as an heirloom. After some deliberation, the family decided against both, donating it to the Franklin Delano Roosevelt Library so it could be added to the collection. It was a rare find, a remarkable discovery, and a small reminder of why John dedicated his life to the appraisal and repair of Oriental rugs. The rug can be seen in the Franklin Delano Roosevelt Library’s main collection, where it is currently on display along with many of the former President’s most-prized pieces.